For a long time computers weren’t thought of as being creative tools in the pure sense. While it was possible to follow some creative pursuits on a computer, this hardware was ultimately always going to be about data and information. The word digital essentially means that everything is made up of 1s and 0s with no shades of grey – and good art has always been about the bits in between. But in recent years that has changed. Technology has become more intuitive and more enjoyable to use while better software and hardware have increased the number of things we can use it for. That’s a good thing too seeing as a lot of design now has to be digital as we consume more and more media online and as computers become more and more integral for business. The Surface Pro 2 is being called the ‘most productive tablet ever’ by Microsoft and to be honest it lives up to that claim in most measurable senses. The idea behind the tablet is to provide the full power of a desktop computer running full Windows 8.1, but packed into a portable tablet body. Better yet, it also comes with a pressure sensitive stylus to enable users to draw straight onto the screen with the device on their lap and create some amazing works of art. The Pro 2 has a better battery life and more viewing angles and better visibility in daylight, meaning that you can now do your work wherever you are in a beautifully made package. If it’s styluses that you want, then really there’s only one phone that will meet your requirements: the Galaxy Note 3. With a huge 5.3” HD display, fantastically powerful internals and the feature-packed ‘S-Pen’ this is the best phone for jotting down ideas and doodles. As an added bonus it also comes with a full version of Sketchbook free, but it’s still not quite going to cut it as complete solution for web designers and digital comic artists – think of it more as a tool for capturing ideas that you can develop later. 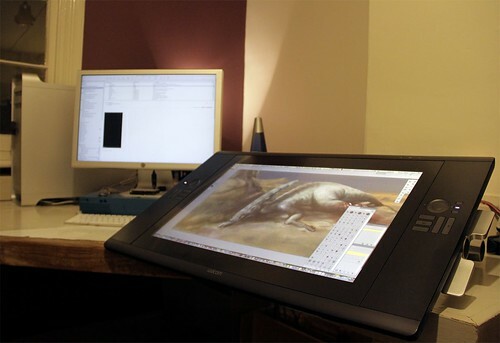 The Cintiq 24HD Pen Display is the option that most professional designers go for right now. While the Surface Pro 2 or a similar slate-computer-with-pen-input will be great for working on the go, this option from Wacom will still give you the most control and accuracy – it just means you’ll need to be sitting at a desk in order to use it. …and for that you will need Photoshop, which is still the best editing software you can find. Of course it’s not just for photos either, it can help you to crop, to add effects, to add text and more. This can give your images that professional sheen like no other software, but you should note that it isn’t particularly cheap. For a free alternative though you can always try Gimp. If the diagrams you’ll be drawing have a more technical nature and are going to be used in professional settings (as logos or banners for instance), then Illustrator is the software you need for creating graphics that are symmetrical, perfectly lined up and high resolution. This is the industry standard in fact for designing packaging etc., so it belongs in your suit of apps! Nancy Baker, the author of this article, is a freelance blogger. She has also written many articles for, Webfirm.com, leaders in online advertising. She is passionate about singing and enjoys performing at the local pub on weekends. You can contact Nancy on Twitter @Nancy_Baker_.